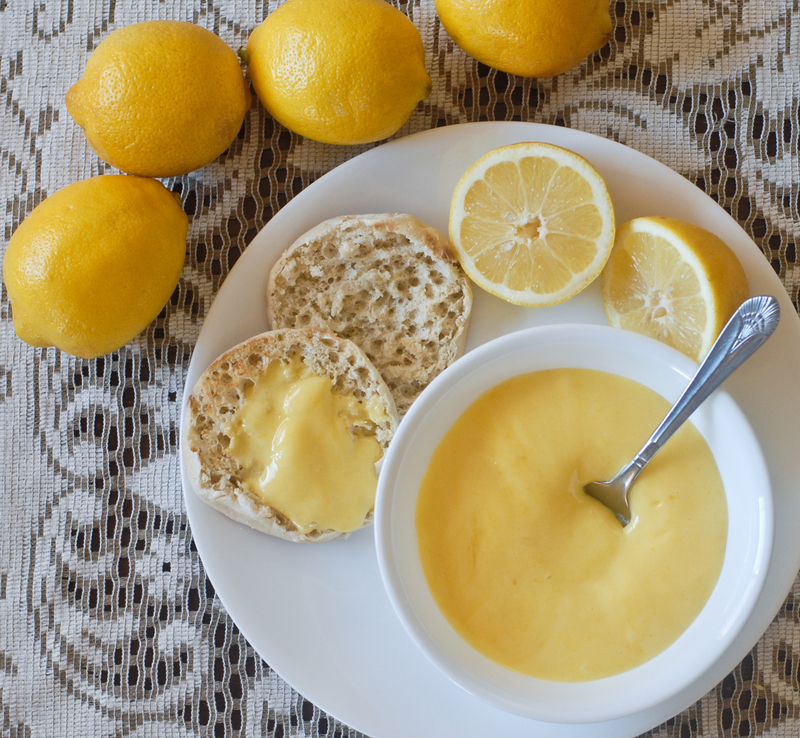 Lemon Curd is a great companion to Irish Soda Farls that we make each St. Patrick’s Day. Curd is essential a fruit custard made with egg yolks. 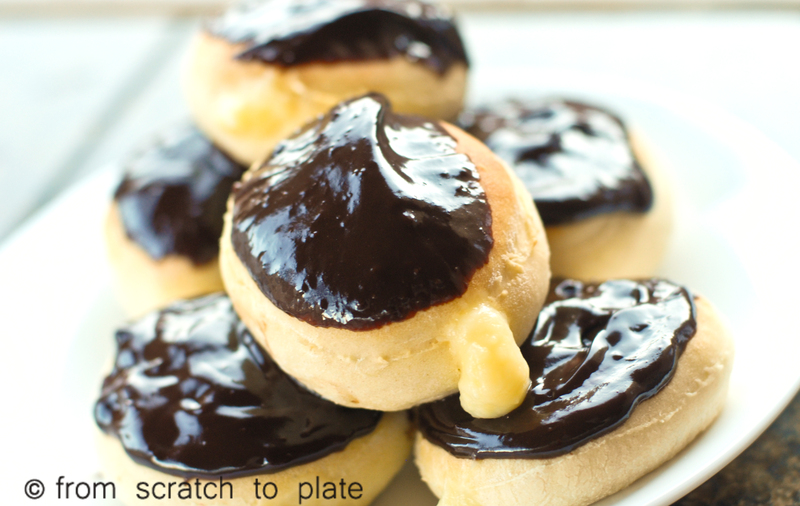 This recipe calls for a double boiler. I don’t know about you, I don’t know anyone who owns an actual double boiler. It isn’t even necessary as long as you have a sauce pot and metal bowl that fit together nicely. You’ll notice in the picture below the recipe my very dirty stove. You will also notice how the “double boiler” should look. You do not want the bottom of the bowl to touch the water. Essentially, the point of a double boiler is to heat something using indirect heat, to avoid it scorching or curdling. It’s used to melt chocolate and make custards, among other things. The custard is heated by the steam created by the boiling water underneath. This lemon curd recipe results in a creamy curd, not the gelatinous kind many use for a lemon meringue pie. It’s perfect for a topping for breads or as a spread. 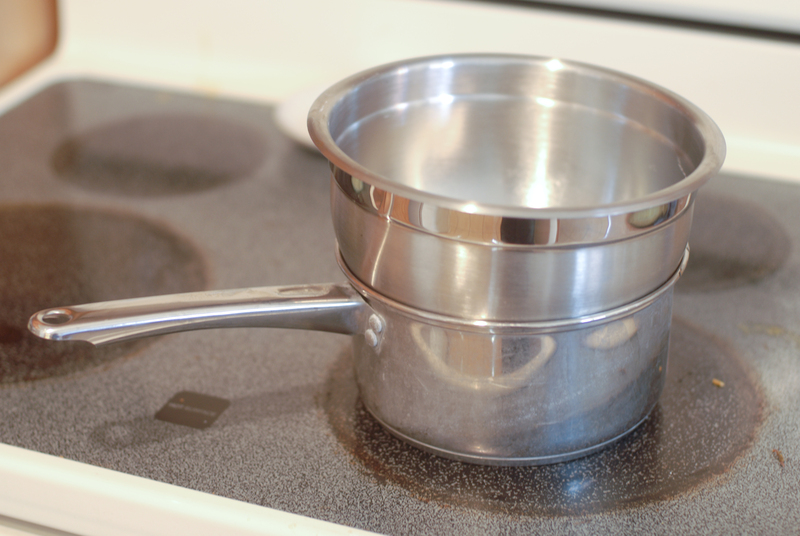 Fill a small pot with about an inch of water, place on the stove over medium-high heat. Meanwhile, in a metal bowl that fits on top of your pot, whisk together the egg yolks and sugar. Whisk well, until light and creamy. For smooth curd, pour the juice through a fine mesh strainer to remove any pulp. Whisk in the lemon juice and zest. When the water comes to a boil, quickly reduce heat to low, to keep to a simmer. Place bowl on pot and whisk continually until thick. This takes about 10 minutes, but will vary. You know it’s ready when it thickly coats the back of a spoon or reached 160 degrees on a candy thermometer. Remove from heat and add in the butter, one pat at a time, stirring each until it melts before adding the next pat. 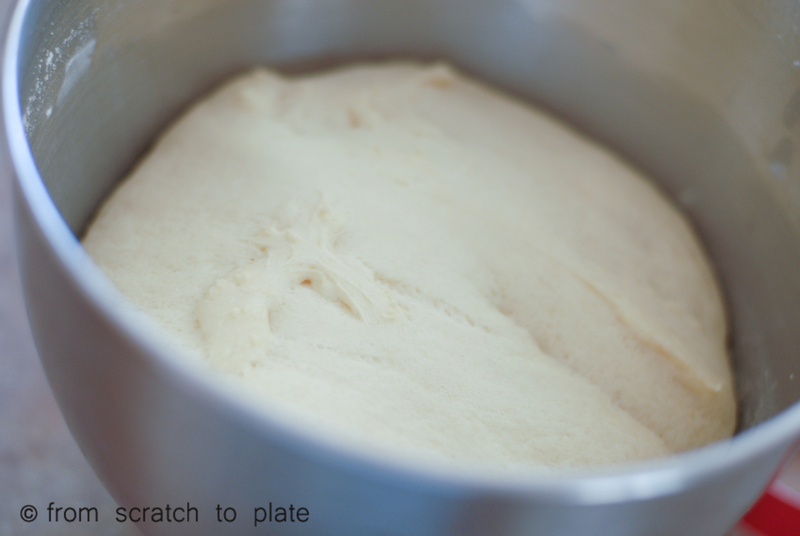 Pour into a container or bowl and press plastic wrap against the surface of the curd. Refrigerate until cool. Hmmm…Doughnuts…Donuts…. Either way, they are tasty balls of fried dough, made tastier when filled or frosted or dunked. SOME people, however, have a hard time stopping with one, two, or four doughnuts, which has made BAKED raised donuts a popular trend amongst the scratch bakers. So, I figured, if I’m going to take the time to make a yeast donut, and save calories by baking it, I have caloric wiggle room to add a cream filling and chocolate frosting, eh? Combine yeast and warm milk in your stand mixer bowl, or in a large mixing bowl. Let sit for 5-10 minutes. Gently mix in butter, sugar and egg (make sure egg is well blended before adding). Add flour, 1/2 c at a time. Add salt in with the first batch of flour. Mix thoroughly after each flour addition. Stop adding flour as soon as the dough sticks together. You definitely want as little flour in your dough as possible. using your dough hook, or hands, if you’re more traditional, knead for 5 minutes. Watch the dough. 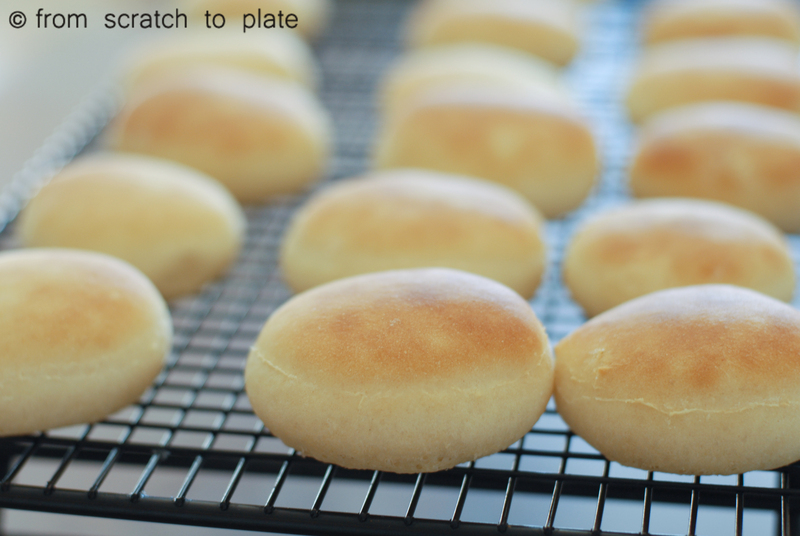 If it starts to stick to the sides, sprinkle a little bit of flour as needed to coax it back into a ball. Again, use as little flour as possible. When I make this, I typically only use 2 cups of flour. Remove bowl and place in a warm place to rise until double (about an hour, but this can drastically vary depending on all sorts of factors). Once it has risen, dump it onto a counter that has been lightly dusted with flour. Roll it out to about 1/2 inch thick. 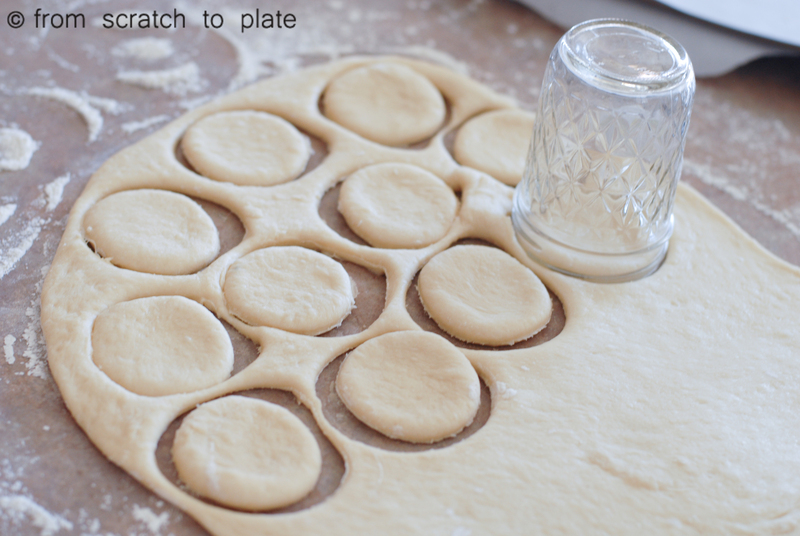 Use a glass or round cookie cutter to cut the dough into circles. Use as much of the dough in the first cut as possible, then collect the scraps and recut. If you must, you can do it a third time, but the resulting donuts will be tougher than the first. 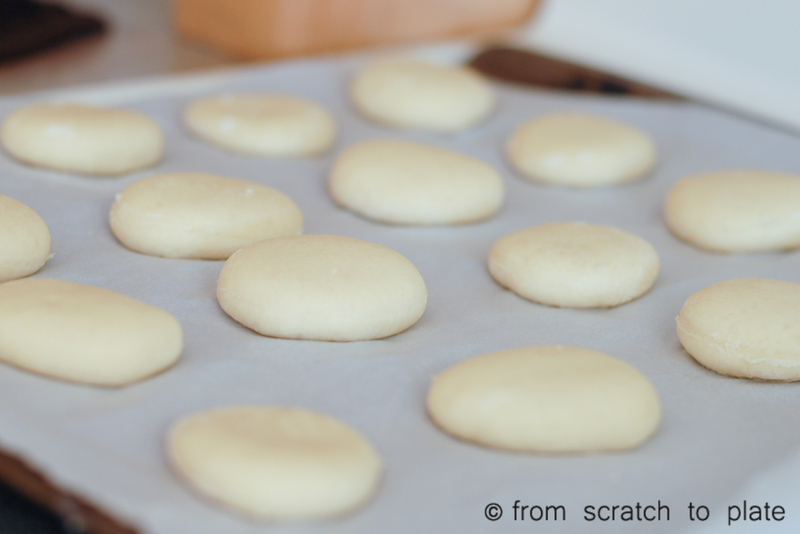 Place the dough circles on parchment-covered baking sheets, about 2 inches apart. Let rise again until double, another 45 min- 1 hour. Preheat oven to 375 degrees. Bake for 5-7 minutes. Remove when they are light brown on top. Immediately slide to a cooling rack. Stir together the milk and 1/4 cup sugar in a heavy-bottomed saucepan. Over medium heat, bring it to a boil. Meanwhile, mix together the egg and egg yolks. Add the cornstarch and 1/3 cup sugar to the eggs and mix until smooth. When the milk has come to a boil, slowly pour a few tablespoons of it into the egg mixture. * Mix well and pour a little more hot milk in with the eggs. Mix well. Pour the egg mixture into the pan with the milk and slowly return to a boil, whisking frequently to keep the bottom from burning. When the mixture becomes thick, remove from heat and stir in butter and vanilla. Pour into a bowl and place plastic wrap to the surface to prevent a skin from forming. Place in the refrigerator until chilled. Pour cream into a sauce pan. Heat over medium heat until hot, but do not bring to a boil. Remove from heat and add chocolate chips. Stir until smooth. Scoop some filling into a zipper-topped bag. Cut a small portion off the corner, insert into the donut and squeeze the filling into the donut. 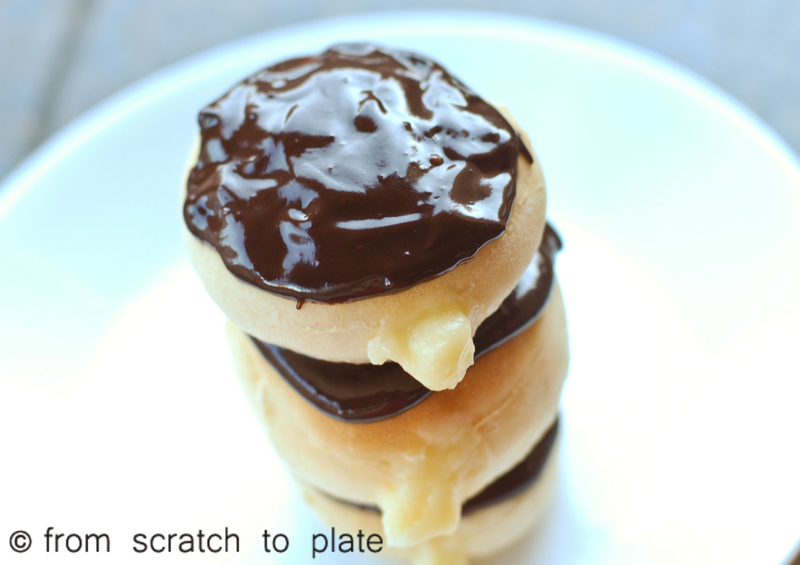 Dip the top of the donut into the bowl of chocolate. Enjoy. With friends…or family…or hot chocolate. *This is called “tempering” the eggs, slowly bringing them up in temperature so that when you add them to the milk, they don’t cook so quickly that you have scrambled eggs in your pastry cream.